Goal 1 – Understand partner’s point of view. There are clear conflict goals you can learn so you can deal much better with the normal relationship conflicts every couple has. Disputes can be managed through understanding, cooperation and persuasion. To maximise cooperation it is necessary to reduce threat e.g. for both partners to stay in “What’s this?” mode instead of “What the hell is this?” mode. This means, be curious instead of furious. Partners must agree that in every interaction there are two valid realities, not just one. Focus not on fact but on perception. It is necessary to convey to your partner that he or she has been heard and understood. Postpone persuasion until each person can state their partner’s position to their partner’s satisfaction. You cannot be influential unless you can accept influence. Rapoport intervention = When you identify a negative quality in your partner, try to see that very quality in yourself. When you identify a positive quality in yourself, try to see that very quality in your partner. 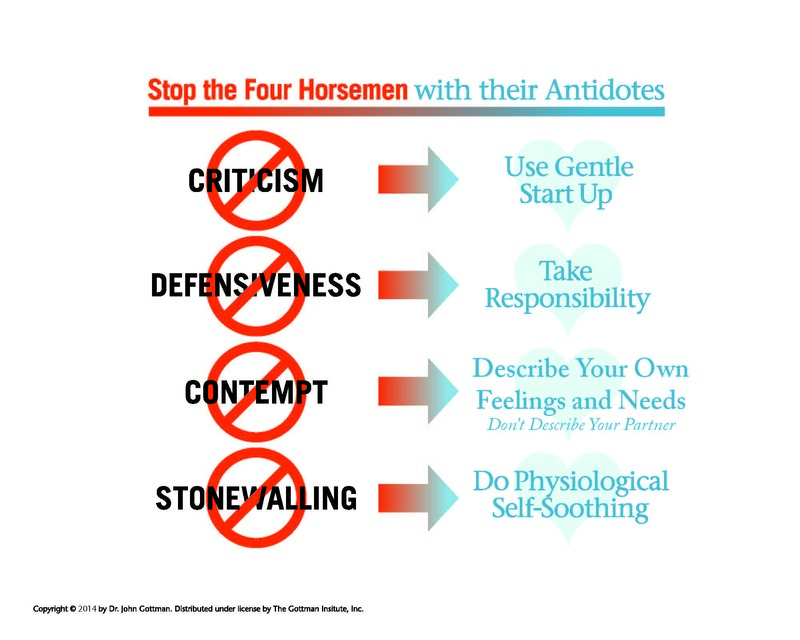 Goal 2 – Eliminate the Four Horsemen and replace them with their antidotes. Goal 3 – Move from gridlock to dialogue on a perpetual issue. Help your partner understand your underlying dreams and hope. (Dreams within conflict skill). 69% of couple issues are perpetual, which means they are due to personality differences & different lifestyle needs. They require dialogue first, then if possible, solutions. Goal 5 – Process fights and regrettable incidents. Use “Aftermath of a fight” skill to process. Describe the anatomy of the fight – use video speak. I felt – use “I feel” checklist. Each partner describes his or her subjective reality. There are always two valid subjective realities and desires. Describe what you need, wish for, what would have been ideal. Stating positive needs is the recipe for success. Move to admitting mode. Helps move out of the fight into observing it. Identify the triggers. What sets off each of your defensive, sad, hurt or angry etc feelings? Why these triggers? Tell the story of why this triggers each of you. Come up with one idea for making a continuing dialogue on this issue better next time. a) What is one thing you’d like your partner to do differently? b) What’s one thing you can do differently next time?